your government’s commitment to the promotion of abortion on demand as a universal fundamental human right. personally championing destructive experiments on human embryos. 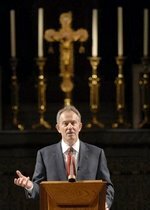 Blair is keen that "faith" in general should be respected as a force for "progress." We could ask with Chesterton "progress towards what?" People of faiths should not be exclusive or "extremist", they should be "open" and not "closed." He praises Karen Armstrong's "remarkable" book that talks about the evolution of religious thought from "earliest times" when it was irrational and unforgiving, to "modern times" when faiths share common values and purpose. Therefore he is setting up a Foundation which will pursue the Millennium Development Goals, and publish information about the different faiths in various media. The Foundation will help those of any faith who stand for peaceful co-existence but "reject the extremist and divisive notion that faiths are in fundamental struggle against each other." It will promote the idea of faith itself as "something dynamic, modern and full of present relevance." Irrelevance is represented by "stark dogmatism and empty ritualism." Whether there can be beautiful dogmas or grace-filled rituals is left unsaid. Reading the lecture, I was struck by how cogently this globalistic pan-religious niceness ignores the real questions over which people of faith disagree with one another and, more, with the humanists whom Blair seems also to want on board the global faith fest. The questions that he raises have been addressed brilliantly by Cardinal Ratzinger in "Truth and Tolerance" but as far as this lecture is concerned, that book might as well never have been written. Faith corrects, in a necessary and vital way, the tendency humankind has to relativism. It says there are absolutes – like the inalienable worth and dignity of every human being – that can never be sacrificed. except in the case of the abortion up to birth of disabled babies? Faith is a living and growing belief, not stuck in one time in history, but moving with time, with reason, with knowledge, informed by scientific and technological discovery not in antithesis to it, as well as directing those discoveries toward humane ends. such as destructive research on human embryos? If people of different faiths can co-exist happily, in mutual respect and solidarity, so can our world. The assumption seems to be that it is people of faith who are the problem. If only people of faith could sink their differences and live in peace, it seems, then all would be find and dandy. In the Britain that has emerged from decades of increasingly secularist government, (not particularly impeded in any way by Tony Blair) the far more disturbing spectre is that of the secularists who are militant, extremist, closed, exclusive etc. (put in the other nasty-denoting words of your choice). The vaunted global mutual respect and solidarity will not survive long in the areas where their writ runs.